i am pretty sure that is a shadow behind Dart. Or he is sitting on top of another black cat. But I am fairly certin he doesn't have three ears. 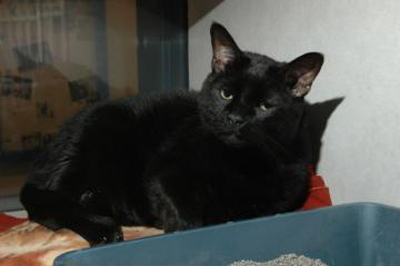 Dart is an 8-year-old male cat who was adopted from Lollypop Farm several years ago and then returned when his family moved and did not take him with them. Dart is a great cat! He has lived with both cats and children and got along well with everyone. Dart is eligible for our Seniors-for-Seniors program, so adopters age 60 and older can take him home free of charge! Come out and meet Dart today!